Unallocated Space is a place for collaborative education and research. We want you to visit our space and get involved! Check our status above to see if we're open. Whenever we're open, we're open to all! Unallocated Space was founded on the principles of sharing knowledge with others in the community. We are always looking for people to teach classes at UAS. If you have an idea for a class please contact us using the form below. Unallocated Space believes in sharing knowledge openly with others. 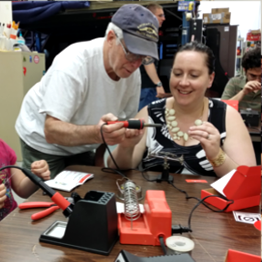 We offer many classes on topics such as microcontrollers, lockpicking and more. Please check out our calendar for a full list of upcoming events. Whether you're building your own electric guitar or a website, members at Unallocated Space offer a wide variety of knowledge to help you complete your project. You are welcome to bring your project by the space anytime we are open. 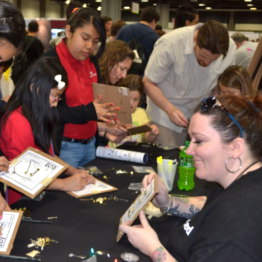 Our mission is to foster creative and technical growth through open collaboration by providing tools and resources within the greater Baltimore-Washington Metro area. Unallocated Space is a 501(c)(3) charitable organization. 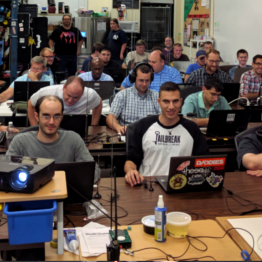 We strive to serve the local hacker and maker community by providing a place where people can learn new skills, build cool projects, and meet like-minded people. Unlike most hackerspaces, all of our events, classes, and workshops are completely open to the general public for free. We have continued to serve the community in this manner for over seven years thanks to our many generous donors. Your donations cover a wide range of (otherwise cost prohibitive) activities. Whether it's a yearly, monthly, or event based they are always greatly appreciated. We gladly accept in-kind donations such tools, computers, servers, technology, supplies/materials, professional services, food, beverages, etc. Consider creating a lasting relationship with Unallocated. Your organization can strengthen your exposure to the community while your generosity generates goodwill and a positive public image. Your time and resources are valuable to you and to others. There isn't anything more valuable to our community than your personal involvement. We accept all types of donations.